Interested in what your readers really pay attention to? Netricks eMags contain advanced statistics functions that may have the answers you're looking for! Every click of the mouse is registered and recorded, giving you the opportunity to see what is being focused on. Using this information, each following eMag publication will be an improvement over the last. The date statistics indicate the number of readings per publication spread over ed date intervals. How long does your reader spend on each page? Which articles and adverts solicit the most attention? The Page statistics answers these questions for you by way of graphic illustrations. What do readers find most interesting about your eMag? With the dot statistic you can see exactly where readers zoom in on most on each individual page. When the reader clicks on a product or area, a field is created. As a publisher, you gain valuable unbiased feedback on your readers preferences, likes and dislikes. In addition to the aforementioned statistics, find out exactly what readers search for in the eMag, how many readers come accross your eMag via search engines such as Google, and what they searched for prior to entering your eMag. All of this information can be transferred to Excel and handled individually. By finding out what your customers are demanding, supplying it for you is simplified. 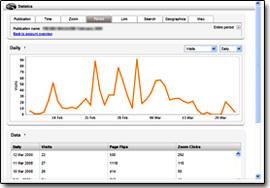 Would you like to monitor your statistics on different eMags simultaneously? With our statistics, you will get a function which generates these reports automatically. For example, you can get the system to send you an email with specific statistics from specific publications at specific date intervals to a number of different e-mail addresses. Stay up to date with marketing numbers regarding online reader trends!